Super Bowl parties can be a buffet of obstacles for those of us watching our calories. There may be a vegetable tray shoved to the back of the table but what happens when you get hungry? 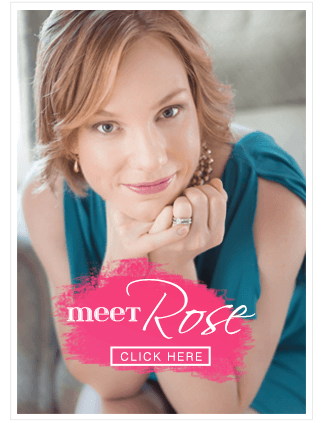 In my experience, my best intentions get kicked to the sidelines when my stomach is growling and everyone else is digging into bean dip, pizza, and piles of chips. Fortunately, I have a solution! 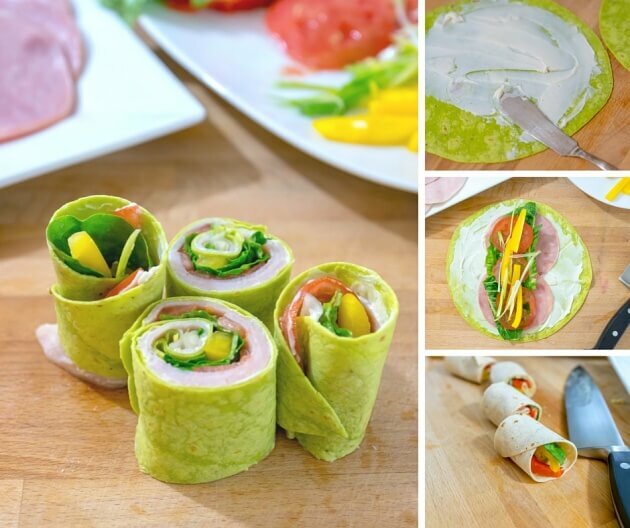 Once you know the basic method you can make pinwheel sandwiches with many different fillings. A low calorie snack, appetizer or lunch that you can make ahead or pack for later. Fits into most weight loss eating plans. Kid friendly recipe – encourages trying new foods. Let kids make their own! Have you seen the trays of pinwheel sandwiches in the grocery store deli? Did you know they are really easy to make? Best of all, you can use a variety of fresh ingredients so you won’t fumble your healthy eating goals. It doesn’t matter if you go gourmet or stick to simple sandwich fillings the pinwheels will look irresistible once they are lined up on a serving tray. I’m not a die hard fan (as you probably guessed from my terrible mis-use of football puns), but I do enjoy a big game. Sadly, we won’t be watching The Hawks play this year. It sure was fun to watch them play the last two years. Their absence won’t stop my family from enjoying Super Bowl 50 with the rest of the country. We’ll tune in to see the Broncos and the Panthers take the field, watch the commercials, and – because I love any excuse to make a meal out of snacks – we will be enjoying a buffet of mostly healthy finger-foods throughout the game. Whomever you cheer for and whatever is on the menu – I hope you enjoy the game, the food, and the spectacle of Sunday’s Superbowl. 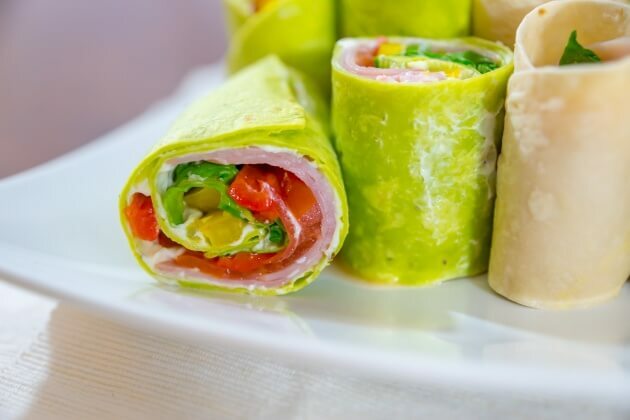 Pinwheel sandwiches are fun to make and easy to customize. Follow the step-by-step instructions for a general method then choose ingredients that suit your taste or dietary preferences - such as low carb tortillas, light Laughing Cow cheese, meat or vegetarian fillings. Use a less-is-more approach to the fillings. Over stuffed pinwheels are hard to roll and frequently fall apart. Cover the tortilla with thin layer of cream cheese or hummus work all the way to the edge - the spread holds the pinwheel closed when you roll it later. Tip: Up your pinwheel game by sprinkling a little feta or blue cheese over the spread before layering on the remaining ingredients. Lay 1-2 slices of deli meat over the cheese. Leave a 2 inch margin room around the edges and keep to one slice thickness. 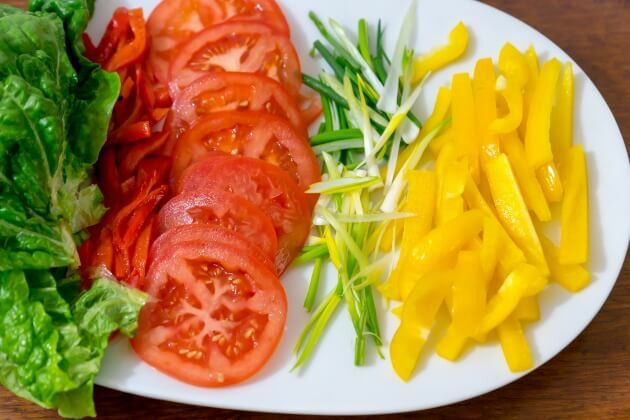 Place thin slices of vegetables in rows across the tortilla. Suggested veggies: cucumber sliced long and thin, bell pepper strips, roasted red pepper, tomato slices, green onion, and spring greens. Roll the tortilla into tight tube, making sure the edges stick down. Slice the tube into 2" pinwheels (4-6 per roll depending on the size of your tortilla) and arrange on plates or trays. 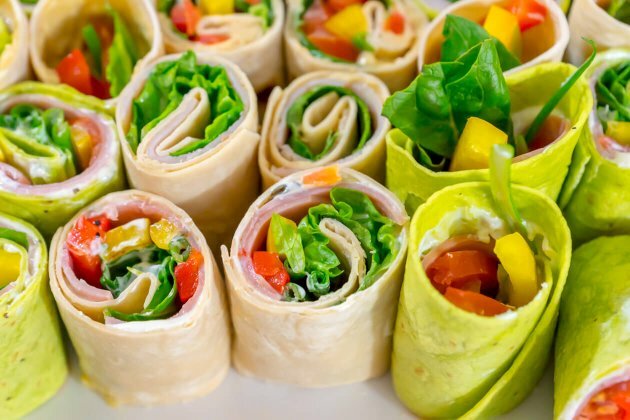 Tip: clustering the pinwheel sandwiches together on a plate will help keep them rolled. Tip: Cut your veggies in to sticks and strips then serve any leftovers on a vegetable tray with your favorite dip.